See "Publications" for white papers, books and reports. As published in Time-Compression Technologies. As published in Desktop Engineering. Fast & Clean: 3D scanning helps a kayak maker navigate between hand crafting and digital design. As published in Moldmaking Technology. As published in Time-Compression Technologies' prototyping selection supplement. As edited/published in Design News. As published in Medical Design Technology. 3D Printers: Mini RP Systems or Expensive Gadgets? As published in Manufacturing Engineering. As published in Moldmaking Technologies. Will the Rapid Prototyping Service Provider Survive? As published in Time-Compression Technologies, co-authored with Terry Wohlers. As published in Industrial Technology. Is CNC Really Better than RP? 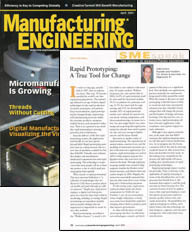 As published in Time-Compression Technologies, co-authored with Lauren Grothe, Ultimate Solutions, Inc.
As published in Machine Design, Carol Reeve, author, Todd Grimm, contributor. Can Technology Acquisition be an Emotional Decision? Published in Automotive Manufacturing International. Published in Time-Compression Technologies, Vol. 3 No. 3.